DAY 37 of SP… Massachusett’s “Dia de los Muertos” is every day… I have come to know Massachusetts as an amazing, subtle, quiet and strong American culture… Flags and memorials , veteran and the like, abound throughout town cemetery, dedicated intersection and town park.. Patriotic vigor in this state is intense but with no malice or hatred for those that you may disagree with.. It’s refreshing. Another snow day..Sunrise to the right, if I could see. 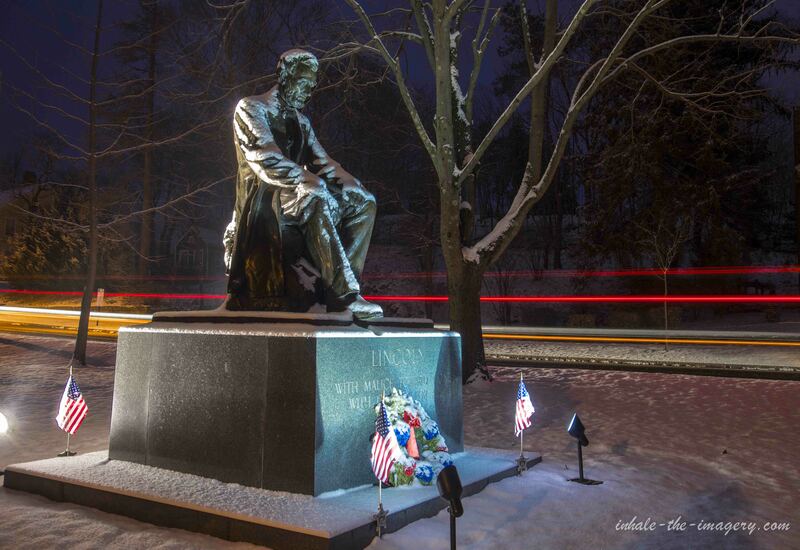 Statue of Abe Lincoln in Hingham. Most of Abe’s ancestors were from the Hingham, Cohasset and Scituate area. With his first American ancestor, Samuel Lincoln, coming from Hingham England and helping settle Hingham, Massachusetts.